Hibiscus heterophyllus are an Australian Native Hibiscus from the East Coast of Queensland and NSW. 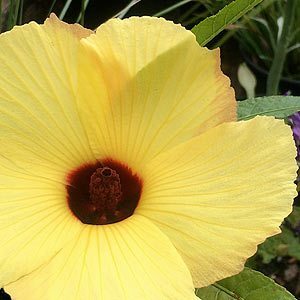 This is a small tree or shrub and flowers come in a range of colours including apricot, white, pink and the yellow form Hibiscus heterophyllus ‘Lutea’. Also known as the Native Rosella, and the flowers buds collected and are used to make a Jam. First discovered nearBrisbane in the early 1800s, this is a medium to large shrub reaching around 4m in height, taller in very shaded positions. Although its natural habitat is in the coastal rain forests of Queensland, it will grow well in cooler climates as long as it grown in a frost free position in a warm sunny spot. Coming from a range of latitudes, species from the southern range are regarded as more tolerant of the cold than those from the northern extent. 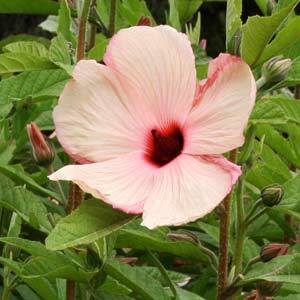 This is a fast growing species, and with attractive white, pink or yellow flowers make a useful garden plant. Flowers are short lived only lasting a few days, however the plant does flower over a long period. A humus rich moist soil is best and they do need some protection from frost. H. heterophyllus can be cut back by 1/3 after flowering to promote a more bushy habit. Hibiscus diversifolius, Hibiscus splendens, Hibiscus sturtii, Hibiscus meraukensis, Hibiscus trionum, Alyogyne huegelii, Alyogyne hakeifolia, Abelmoschus moschatus subsp.tuberosus and Gossypium sturtianum.